“Mara Zampieri began her career with performances at the major theatres in Rome, Trieste, Palermo, Naples, Bologna, Catania, and Milan, where she appeared at the Teatro alla Scala in IL TROVATORE, DON CARLO, I MASNADIERI, IL BALLO IN MASCHERA and in 1991 in LA FANCIULLA DEL WEST with Plácido Domingo. Since 1976 she has appeared at the opera houses of Europe: London. Berlin, Hamburg, Munich, Brussels, Paris, Lisbon, Zürich, Madrid, Barcelona and Vienna. She has sung in San Francisco, New York, San Paulo, Buenos Aires and Tokyo. She lent her voice to the parts of Teresa Stolz in the film LA VITA DI VERDI by Castellani, and Ildebranda Cuffari in the film E LA NAVE VA by Federico Fellini. In 2003 she inaugurated the Festival do Estoril in Lisbon and the Symphonic Season in Prague (Smetana Saal) with two concerts dedicated to Hector Berlioz on the bicentenary of his birth. Bruson was one of the foremost bel canto and Verdi baritones of his generation, and while this side of his artistry is lesser-known in the United States, he was also an accomplished song performer, specializing again in Romantic-era Italian works. He frequently championed the songs of Tosti, and was named an honorary citizen of Cortona, Tosti's home city, in recognition of this. While his Verdi roles are perhaps his best-known, especially Macbeth, Rigoletto, Renato (UN BALLO IN MASCHERA), and Simon Boccanegra, he sang in no fewer than seventeen Donizetti operas during the 1970s and 1980s, just ahead of the crest of a great resurgence of interest in lesser-known nineteenth-century works. He made his opera début as the Conte di Luna in IL TROVATORE at Spoleto in 1961. He appeared at the Met for the first time in 1969, as Enrico in LUCIA DI LAMMERMOOR, and made his La Scala début in LINDA DI CHAMONIX in 1972. In 1973, he made his Chicago Lyric Opera début as Renato in UN BALLO IN MASCHERA, and in 1975 he made his Covent Garden début in the same role, substituting for Piero Cappuccilli. His Vienna State Opera début was in 1978, as Verdi's Macbeth. He sang with Riccardo Muti for the first time in 1970, and over the years became an adherent of Muti's insistence on singing come scritto, without singer-interpolated high notes, believing that this focuses attention on the music and drama rather than the singer. “BELISARIO is, quite simply, one of Donizetti’s finest achievements. 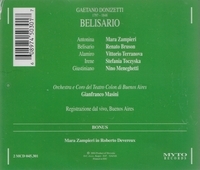 Dating from the high watermark of Donizetti’s maturity, with its premiere in 1836 (the year after the début of MARIA STUARDA in Milan and LUCIA DI LAMMERMOOR in Naples), BELISARIO proved a triumph on stages throughout the 19th century. Yet, incredibly, it is little known today. The libretto, by Salvadore Cammarano (who collaborated with Donizetti on LUCIA DI LAMMERMOOR), tells the moving and typically complicated story of the 6th century Byzantine general. Falsely accused by his wife, Antonina, of killing their son, he was blinded and exiled as his punishment. Only the recognition by his daughter, Irene, that her father’s former captive, Alamiro, was her long-lost brother restores Belisario’s reputation; tragically, too late to save his life. BELISARIO (Belisarius) is a tragedia lirica. Luigi Marchionni's adaptation of Eduard von Schenk's(de) play, BELISARIUS, first staged in Munich in 1820 and then (in Italian) in Naples in 1826. It premiered to critical and popular success on 4 February 1836 at the Teatro La Fenice, Venice, and was given many additional performances that season, although Donizetti scholar William Ashbrook notes that there would have been more had the opera not been presented so late in the season. However, in spite of its initial short term success and critical reaction, as represented by a review in La Gazzetta privilegiata which stated that ‘A new masterwork has been added to Italian music.....BELISARIO not only pleased and delighted, but also conquered, enflamed and ravished the full auditorium’, in the long run, had ‘Donizetti poured music of the calibre of his LUCIA DI LAMMERMOOR into the score of BELISARIO, the shortcomings of its wayward plot and dramatic structure would matter less’. With the success of LUCIA DI LAMMERMOOR in September 1835, Donizetti moved on to stagings of MARIA STUARDA, the first under that name at La Scala in late 1835. He had signed the contract in July 1835 to present BELISARIO in Venice, for what would be the first visit to that city since 1819, but it was not until October that the subject was finally agreed upon. By the time of the first performance, which was well received, Donizetti reported to his publisher the audience's reaction to most of the numbers, specifically that ‘in the duet for Vial and Salvatore, many shouts of bravi, but at the end (so they say) the situation is so moving that they were weeping'.